What prompted your decision to lose weight? I gave birth to my twin baby girls in December 2014, after 7 long years of struggling with infertility and multiple IVF Cycles, we were over the moon. I was 12st168lbs76.2kg before my pregnancy and only weighed 13st 5lbs187lbs84.8kg after. I have been a bit of a 'yo-yo' dieter my whole life, ranging from a size 10 to size 20 at my biggest. I really wanted to get my eating habits under control and be a healthy role model for my girls, so that I didn't pass on any bad habits to them as they grow up. When the girls turned 3 months (March 2015) I decided it was time to make a start. I was unfortunately unable to breastfeed so I didn't need to worry about my diet impacting on their nourishment. How did you hear about Nutracheck? I wanted to lose the weight in a healthy way, so I went onto the NHS BMI Calculator to check where I was and what goals I should be aiming for. For my weight and height I had a BMI of 29.3 which put me in the obese category, right at the very top. It said that a healthy weight would be 8st 6lbs118lbs53.5kg to 11st 6lbs160lbs72.5kg. I followed the link to the "Why this Result Matters" and downloaded the healthy eating plan. 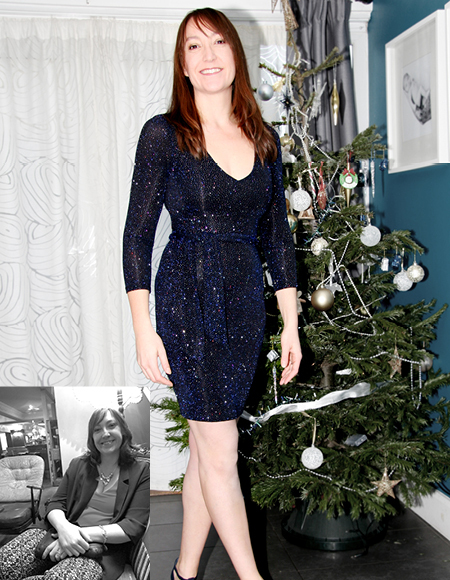 I set myself a goal to lose 3 stone42lbs19kg from March to October, so that I could fit back into a dress I wore for our engagement, by our anniversary in October 2015. I downloaded the Nutracheck App, printed the sheets and stuck them up at home - I met my goal and was back in my dress for our anniversary. Did you find it easy to maintain the weight and what did you find most difficult? Because I hit my target I decided I didn't need to calorie count anymore - I was ready to do it on my own. I started going to an exercise class with friends and it was going well. Then life became a bit harder. The twins were getting older, they were teething and not sleeping. I was so tired from looking after them. I had to return to work and do night shifts. Then a family friend became unwell, so I wanted to spend as much time traveling to see them. My weight became less of a focus and before I knew it 8 months had passed and a lot of my old habits had returned, and I had gained 1 stone14lbs6.3kg. It was after a family get together where I couldn't fit into my clothes and saw a photo of myself that I thought, I need to do this once and for all. So in June 2016 I started using the App again. The best thing I have found is the section where you can create your own recipes. Over time I have developed all our typical family meals to become healthier and healthier. It has to be a change for life and not a diet. My partner has also lost about 1st 7lbs21lbs9.5kg just by the changes to our evening meals and me being a healthier influence on him. By using the App you learn how many calories and how much fat things contain, which means it's easier to make healthy choices. You have to be honest with yourself and I weigh everything... which does drive people mad sometimes! My partner says "why are you weighing that bit of bread!" But you really notice that all the little extras here and there make a big difference to your overall calories. I started back on my journey in June 2016 and before I knew it it's December 2016. I don't know where the time had gone. It really has become second nature now. The last little bit of weight I lost has really seemed to make a difference. I lost the extra stone I put on, then the weight just kept coming off. I am so busy on a daily basis with the twins, walking the dog and work that I did not have time to exercise, my life was active enough. I went from a size 14 to a size 12. I have just been shopping and could fit into a size 10 and even they're loose on my waist. I was a size 14 before I even had the twins, I can't quite believe it. How do you feel now compared to before? I feel fantastic. My next goal is to get fit. I have started running with my dog and pushing my twins in the pushchair. Pushing around 6st84lbs38.1kg a couple of miles sure gets you fit! It is difficult to find time to get out to exercise classes. I don't have any childcare or anyone that would watch them so I can just have some me time. I did go to a class where you can take your little ones but it was quite far away and with two-year-old toddlers it was challenging. By the time they go to bed in the evening the last thing I feel like doing is working out. Through my time using the App, my 200 daily calorie burn has been cleaning the house after the children! So going running with the girls in the pushchair and getting the dog walk/run done at the same time is a brilliant way to get several things done at once. Any notable milestones to report? Now that I have achieved my goal I have amended the App to maintain my weight as opposed to losing it. I did feel a bit anxious about this at first as I was scared that I would put weight back on. But it has worked well and I have maintained my weight for probably a month now. I am hoping that it will become second nature to me and that eventually I will be able to make the right choices on my own without needing to weigh everything and input it into the App. I am very happy with what I have achieved and I'm confident that once I have maintained this weight for 3-6 months I will be ready to go it alone. My BMI is now 19.7 which is a good healthy weight for my height and I really want to promote health over appearance. Using the App has revolutionised how I eat and look at food. I'm happy and healthy and a great role model for my children. Thank you Nutracheck. What 3 tips would you give to anyone who has weight to lose? Be honest with yourself and weigh everything... the little bits & bobs add up. If you gain weight don't give up, just try again. Use the create your recipe section and make your meals healthy for all the family. Be positive, stay focused and little by little it will come off. Before you know it you will be like me, looking back over the past year or two, feeling fantastic, looking great and being so pleased you stuck to your goal. Give it a go... you can do it. Good luck!